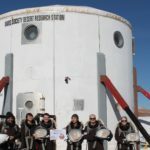 Our MDRS mission dates were from March 16, 2019 to March 27, 2019. We completed a total of 7 EVAs. Crew 207 Medical Makers Scientist and HSO 3D printed 17 labware items and tested their functionality in the MDRS Science Dome. Many of these print files were prepared by 34 participants of the inaugural MMYMM Medical Make-A-Thon hosted at Keyano College in Fort McMurray, Alberta on March 10, 2019. 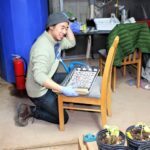 On March 22, Crew 207 Medical Makers experienced a brief power interruption at MDRS while 3D printing a slide drying rack out of biodegradable plastic. Fortunately, our 3D printing system was able to continue and finish printing this functional item after power was restored. Crew 207 Medical Makers showed that a renewable, green energy source can power a 3D printer to use biodegradable plastic to make an ISS medical inventory item, a customized medical device that was previously printed on the ISS, and a spare part for a self-replicating replicator on-site during a Mars analogue mission. Six crew members cycled for 1 hour per day for a total of 2 days per crew member on a bicycle to charge a battery that was used to power the 3D4MD 3D printing system. Crew 207 Medical Makers used this bike-powered battery to 3D print a tongue depressor and customized mallet finger splint out of food-safe, biodegradable plastic and a replacement knob for the 3D printer’s LCD out of recyclable, biodegradable plastic. Crew 207 Medical Makers data has been compiled and been transmitted home for analysis and manuscript preparation. Data collection will continue with Crew 208 Medical Makers. 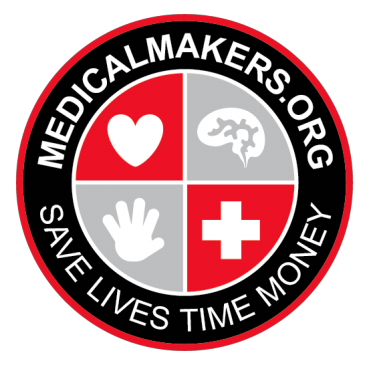 Crew 207 Medical Makers identified 30 items that would be useful to 3D print at MDRS. These items will be distributed as design challenges to Crew 208 Medical Makers, Medical Make-A-Thon participants and 250+ Medical Makers in 10 countries. Crew 207 Medical Makers Journalist, Diane Rothberg, observed that it would be helpful to use a clip to re-seal our opened bags containing flour and brown sugar. On March 20, Crew 207 Medical Makers Commander, Dr. Julielynn Wong, reached out to members of the Medical Makers YHM Chapter who have been re-designing and testing a watertight, reusable, 3D printed pouch clamp for stoma patients. They immediately uploaded their print files to the Medical Makers shared drive and Crew 207 Medical Makers was able to 3D print and use their design to re-seal a food bag at MDRS on the same day. 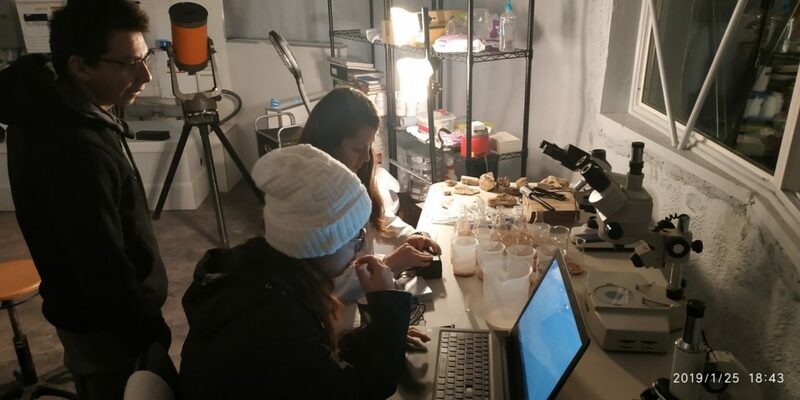 On March 23, Crew 207 Medical Makers Scientist, Tiffany Ni, used an open-source design and freeware to create and 3D print customized funnels matching the dimensions of 3 different funnels found in the Science Dome at MDRS. 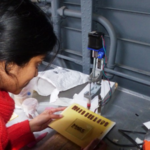 By creating 3D printable designs of useful items at MDRS, Medical Makers can add files to 3D4MD’s digital archive to benefit remote and low-resource communities in need. Crew 207 Medical Makers observed that each individual crew member was using multiple cups per day because the cups provided at MDRS are identical in design and color. This meant that the crew had to wash extra cups every day. 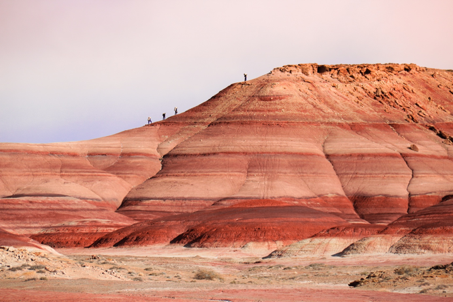 This led to an increased consumption of water which is a limited and valuable resource at MDRS. 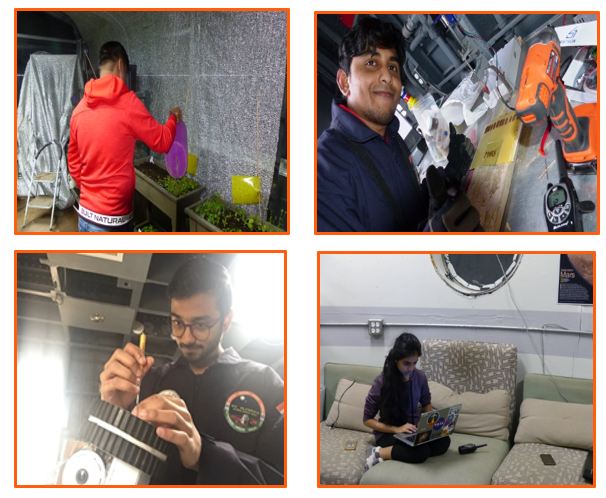 By March 21, all six crew members were using 3D printed colored straws to identify their personal cups for re-use all day. This helped conserve our water resources at MDRS. Five crew members with no prior surgical training used a porcine and 3D printed thoracentesis trainer to acquire life-saving procedural skills to decompress a tension pneumothorax on a simulated patient. Three performance metrics were measured; performance score, procedure time and learner’s confidence. Data collection will continue with Crew 208 Medical Makers. Three out of seven components of 3D4MD’s thoracentesis trainer were successfully 3D printed at MDRS during the Crew 207 Medical Makers mission. The remaining four components will be 3D printed during the Crew 208 Medical Makers mission. Crew 207 Medical Makers Part 107 pilots used a camera drone to complete four pre-programmed drone mapping flights of MDRS and the surrounding region. Map processing and 3D printing will continue with Crew 208 Medical Makers. Crew 207 Medical Makers flew a camera drone to conduct an outdoor inspection of the MDRS Habitat roof during a simulated emergency. Four novice drone pilots compared the performance of a traditional and new drone controller when flying in a square pattern (60 feet for each side) at an altitude of 20 feet. Post-flight surveys were completed and qualitative feedback was obtained. Preliminary feedback has been submitted to the drone controller manufacturer. More flight testing is planned for Crew 208 Medical Makers. Crew 207 Medical Makers is grateful for the financial support of Dr. Robert Milkovich and Mrs. Marijana Milkovich, the University of Toronto Collaborative Specialization in Resuscitation Sciences – Institute of Medical Sciences Travel Award, Ron Rivkind at Filaments.ca, and Schulich Leader Scholarships, Canada’s most coveted undergraduate STEM scholarships. 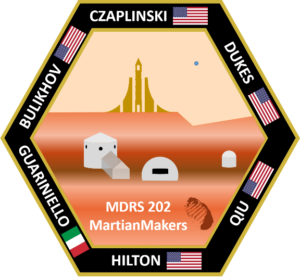 Our MDRS projects were also made possible thanks to Atila Meszaros, David Mateus, and Shannon Rupert at the Mars Desert Research Station, Dean Vincella Thompson at Keyano College, Marius Kintel at OpenSCAD, Dr. Scott Parazynski and George Guerrero at Fluidity Technologies Inc., Jack McCandless, Jade Bilkey, Crew 208 Medical Makers, and members of the Medical Makers YGK, YHM, YKF, YMM, YVR, YYT and YYZ Chapters. 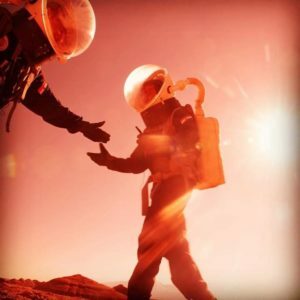 Establishing a human presence on Mars is increasingly seen by space agencies and private organizations as the horizon frontier in human space exploration. These long-duration mission impose a high degree of technological, operational, physical and psychological challenges. 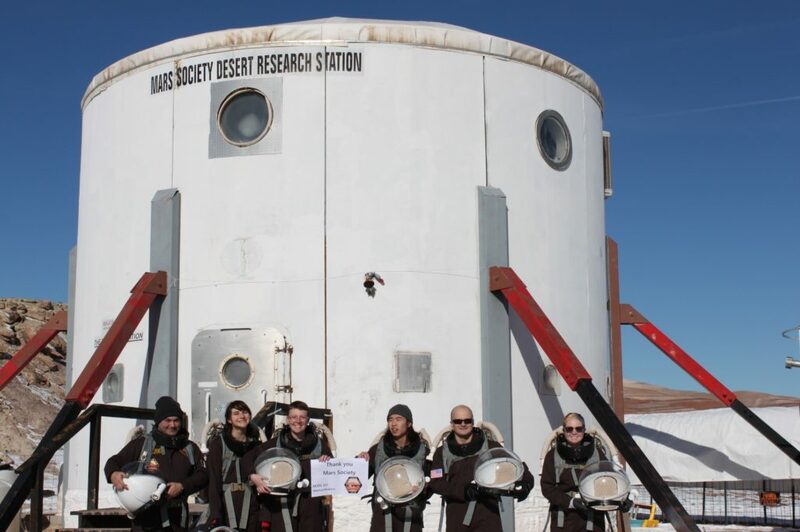 Mars analog habitats, such as the Mars Desert Research Station (MDRS) in Utah (U.S.) are established to conduct field experiments, test new hardware, new operational concepts and study the social and crew teamwork dynamics in support to these future manned missions to the Red Planet. 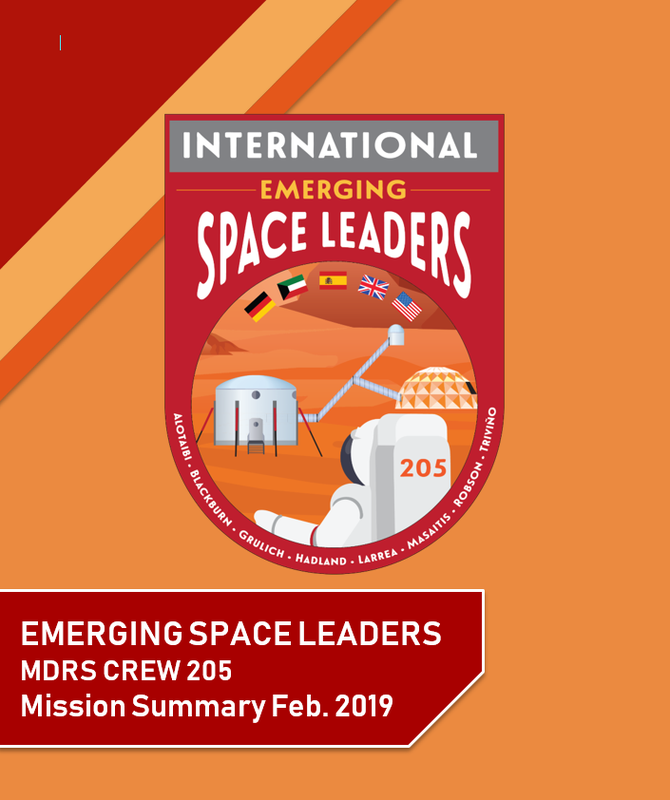 The International Emerging Space Leaders (IESLs) Crew (or MDRS Crew 205) was composed of eight international young professionals and students, who together undertook a Mars analog mission from February 9th to 24th at the MDRS. 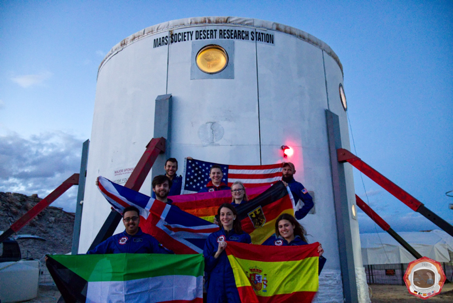 The IESL’s Crew was an interdisciplinary team including members from Kuwait, Spain, Germany, the U.K. and the U.S. During the two-week rotation, the crew conducted multiple research projects in support of future analog and space manned missions. A key goal of the IESL crew was to identify key aspects for successful leadership in future space missions. As a case study, the crew rotated command roles during the mission, evaluating each other’s leadership performance during the mission. 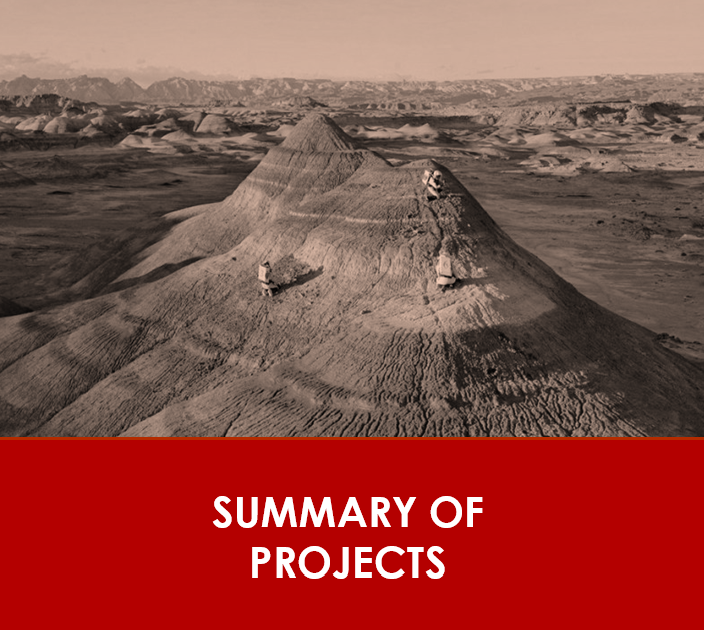 The team conducted multiple additional research projects relevant to space exploration in areas such as in-situ resource utilization, astronomy, geology, EVA optimization, and science outreach. This mission aimed at contributing to a better understanding of the requirements, benefits and challenges of international teams in future manned missions. 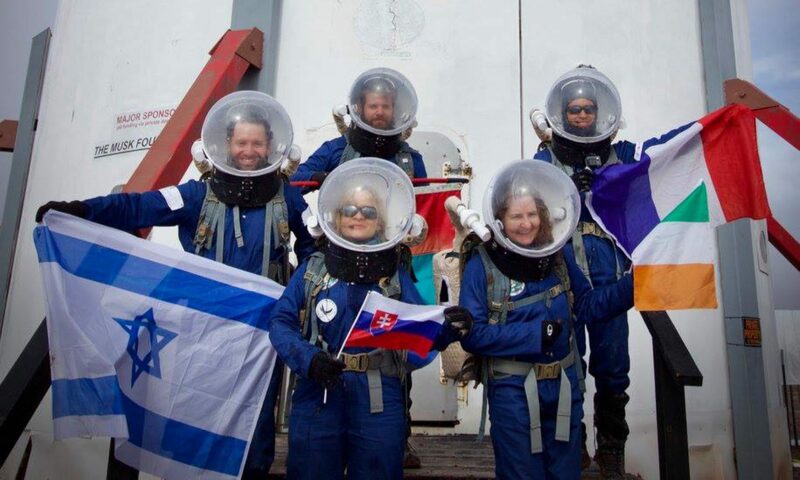 The IESLs Crew was supported by several partners around the world including the Florida Institute of Technology and the European Space Agency’s EuroMoonMars program. 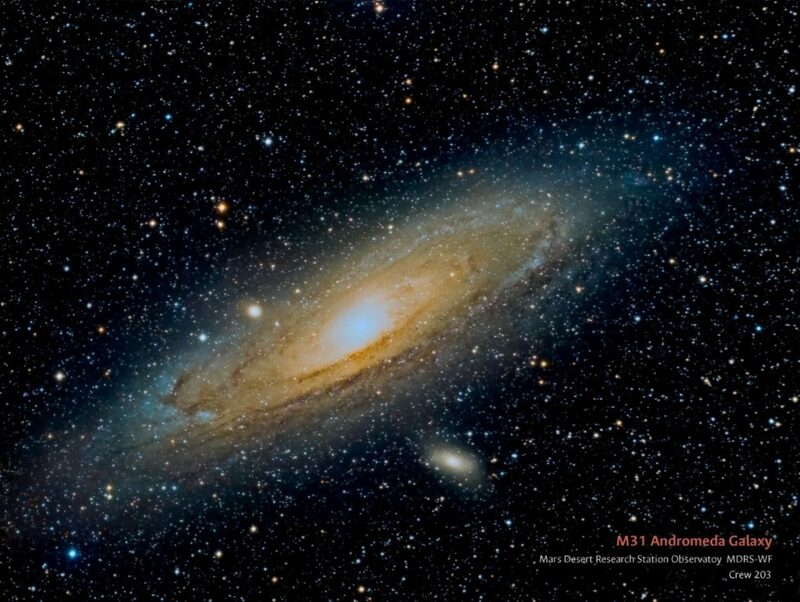 Moreover, outreach programs are going on using the following networks: Pi Lambda Phi fraternity (USA), Astrobiological Research and Education Society (USA), Space School UK, UKSEDS, UK National Space Center, University of Leicester (UK), Space Generation Advisory Council, The Scouting Movement, University of Munich (Germany), ILEWG and ESTEC (Netherlands). 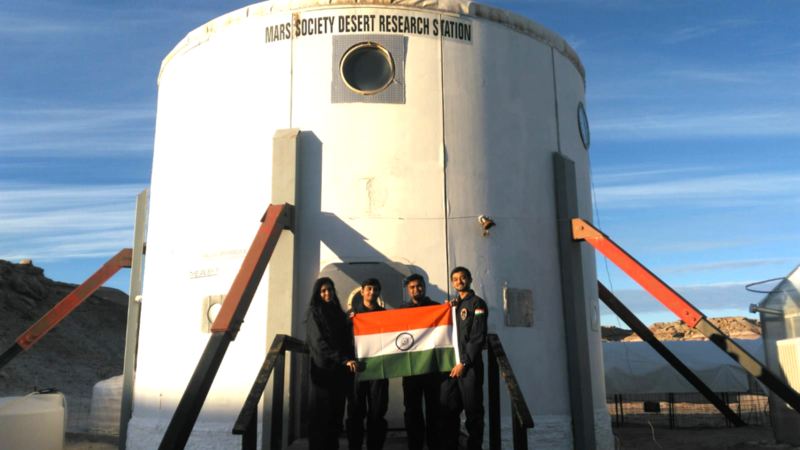 A key goal of the MDRS IESL crew was to develop the leadership and teamwork skills of all crew members. 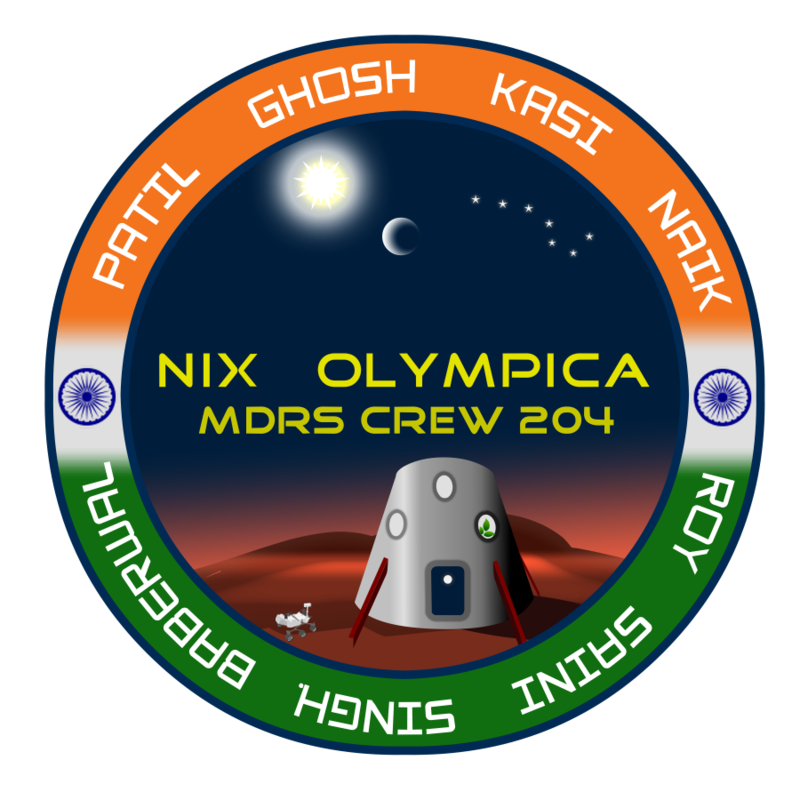 As a case study imposed by the Mars Society, all crew members rotated roles during the mission (i.e., all crew members acted as commander and XO at least for a day). 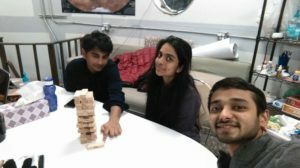 This project had a twofold objective: strengthen crew members’ leadership and teamwork skills, and identify key aspects for successful leadership and teamwork in future analog and space missions. Pre- Mission Survey: self-assessment of personal leadership skills and expected performance of the crew prior to the mission. Mission survey: daily surveys filled by all crew members during the mission including a self-assessment survey (for commanders and XOs) and peer assessment surveys. Debriefing: evaluation of the team’s performance, challenges faced, areas for improvement, etc. Results Consolidation and Analysis: consolidation of the survey results and analysis. The data derived from the study will be combined and analyzed after the mission. The results will be summarized in a white paper to be submitted to the Mars Society. In situ resource utilization (ISRU) strategies on Mars include the use of local regolith for plant growth. Regolith samples collected on the surface of Mars will not be uniform and consequently must be benchtop tested to determine their composition and properties by astronauts on Mars before being used for large scale food production. 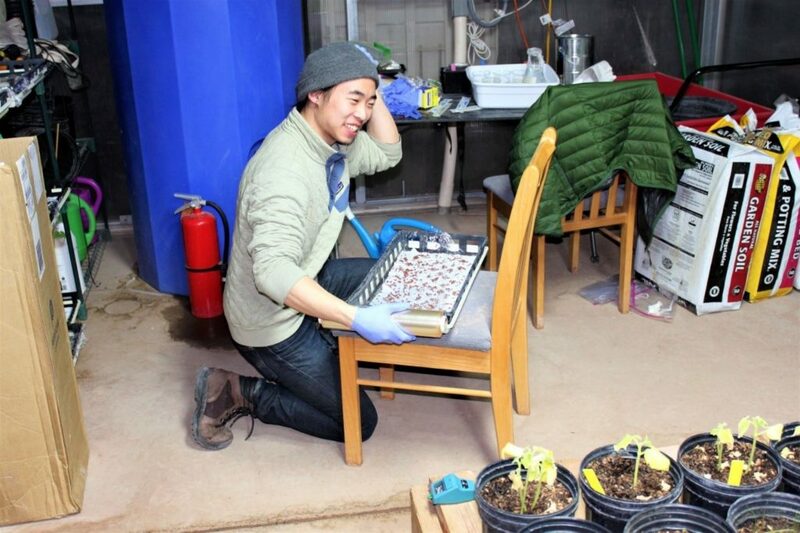 The purpose of this study was to investigate the viability of regolith collected around MDRS to support the growth of the model plant Arabidopsis thaliana. thaliana was sterilized with bleach and ethanol and germinated on agar. After three days, the seedlings were transferred into regolith samples collected on EVA in halved 50 mL conical tubes using a nutrient agar media plug. 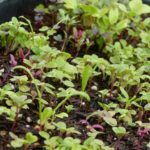 The samples were subsequently watered using Hoagland’s #2 hydroponic nutrient supplement. Several samples dried out within several hours of transfer. The experiments that died in the first trial were restarted using the same method as above, using more care to pack the regolith around the plug to prevent dehydration. The pH of the regolith was measured using ASTM protocol D4972. The lower pH solutions appear to have performed the worst, with organisms dying within a few days of the beginning of the experiment. 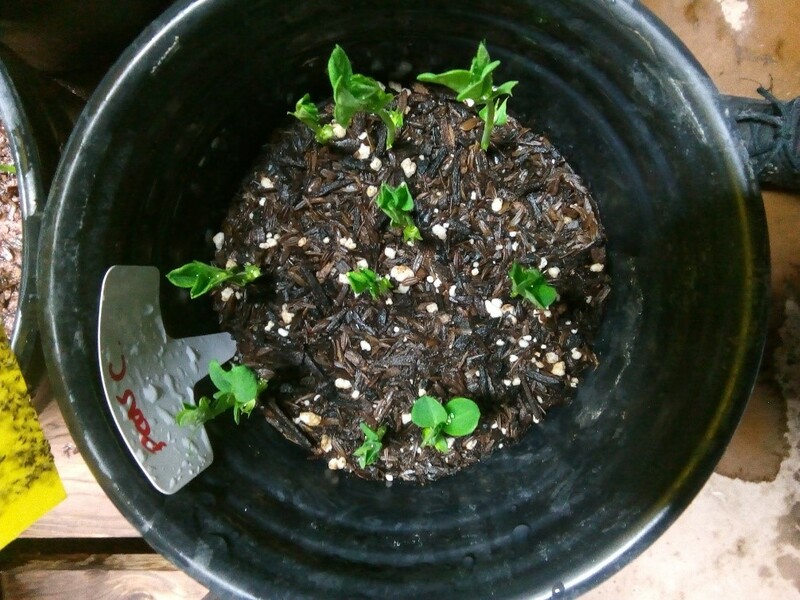 Samples 2 and 3 emerged as the more viable substrates to support the growth of A. thaliana. Sample 2 is composed of an opaque dark material interspersed with quartz particles and becomes clay-like upon contact with water. Sample 3 is composed of similar particles with a larger mosaic of sand. Although it is not apparently clear from their geological properties, their success as a growth substrate was likely due to their wettability (quantitative ability to retain water), larger average particle size, and relatively neutral pH as compared to the more acidic samples 1, 5, and 6. Drastic variations in pH can cause nutrients provided to the plants using Hoagland’s to precipitate out of solution. 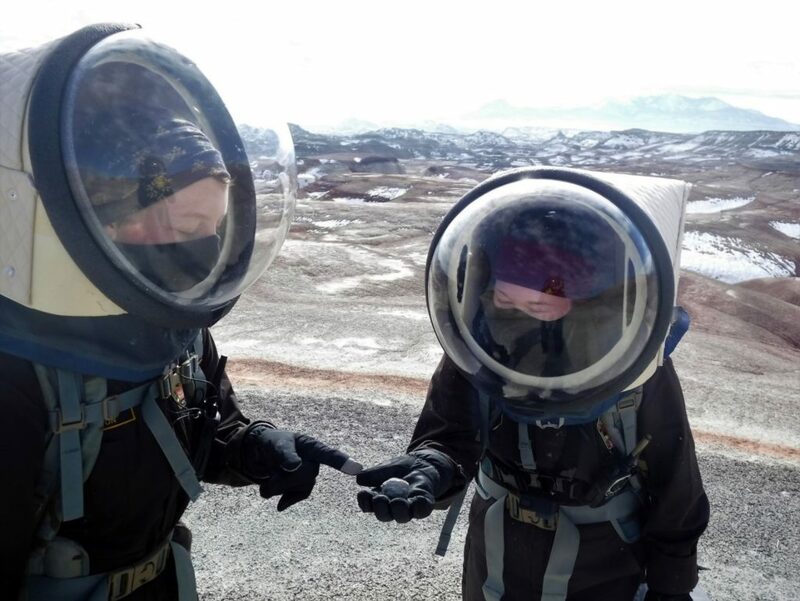 To make food production on Mars feasible and sustainable, baseline tests like these are necessary in order to determine the suitability of substrates. SAMPLE ~PH (DI WATER) ~PH CACL2 AVERAGE STD DEV RESTARTED? TRIALS ALIVE? As shown in the table above, the only completed observation request was for SY MON. 4 photometry measurements were performed for SY MON as per the following table. 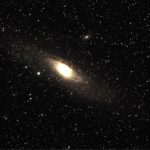 The Magnitude Value of 14.132 was submitted for the AAVSO website. 14.118 140 143 132 No check star because this is manual calculation – It was found that Comp 97 positioned outside the straight line of the curve, thus it was decided to exclude it. Drone for lighthouse: The drone flew stably at altitudes below 6m, while carrying neon tape weighted with washers. Unfortunately, the neon tape acted as a kite and pulled the drone off-course. An alternate source of visibility could be used for this proof of concept to be more viable. In tests performed inside MDRS, the drone lifted a sizeable glow stick. If a stronger drone with a brighter, heavier glow stick attachment system could be flown and survive higher winds stably, then the method could be implemented successfully. Drone for pre-scouting: The drone flew successfully at altitudes below 10m on flat areas near MDRS and on top of Kissing Camel Ridge East. Photos were captured over target areas of an appreciable area better than could be visualized by a human on the ground or by satellites. These photos could be uploaded to a laptop in the field. Use of a scale marker (3 m of neon tape) allows the images to be used for accurate mapping. However, the ground often appeared too bright, meaning smaller features were hard to resolve. 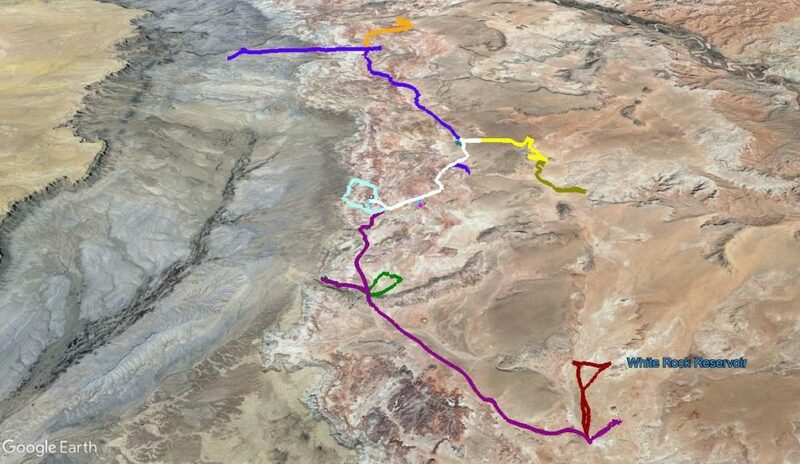 With an improved camera and a drone capable of flying stably to higher altitudes, this could be a viable tool for mapping landscapes around an EVA crew. Laser Rangefinder: The laser rangefinder was used in the field and tagged distant and difficult to outline objects such as cliffs, ridges and the MDRS base. However due to the dimensions of the EVA helmet visor, it was difficult to see through the viewfinder. If the device could be mechanically incorporated into or onto the helmet visor with a more ergonomic operating procedure, then the tool could be a useful planetary exploration tool. 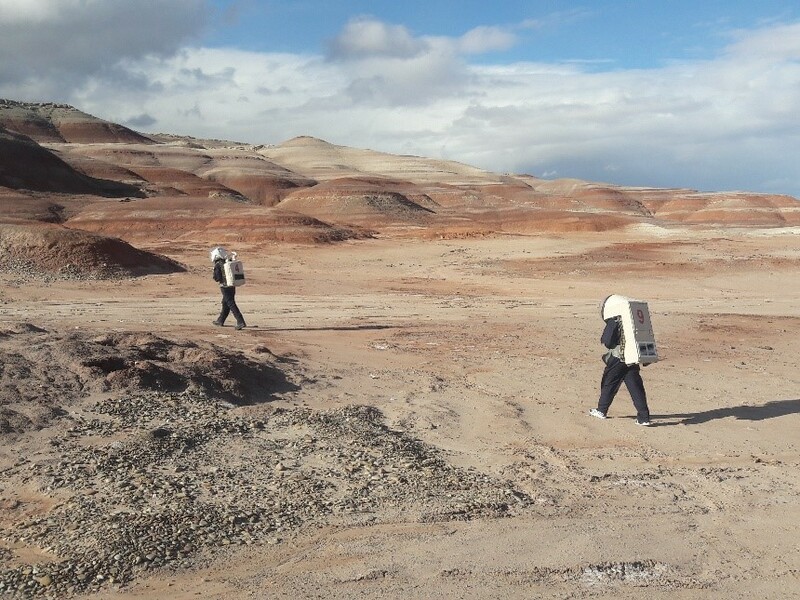 Analysis of the first few EVAs conducted by crew 205 during their rotation at MDRS showed that the success of an extravehicular activity (EVA) depends highly on both the EVA crew and Support crew being aware of planned objectives and intended routes. This means that both parties should conduct EVA planning together, in order to understand what should be accomplished and what hazards could impact EVA outcomes. Pre-and-post-EVA checklists and SOPs were created to allow crews going on EVA to expose deficiencies in both the planning and execution. This allows team members to improve the process of preparing for an EVA, leading to more effective and safe EVAs. The Post-EVA Debrief checklist in particular will (when utilized by successive crews of planetary analog sites) expose complacency and help leaders to conclude which issues are impeding objectives from being accomplished. Conducting a mission at MDRS requires adequate and effective planning and execution of all steps in the mission. 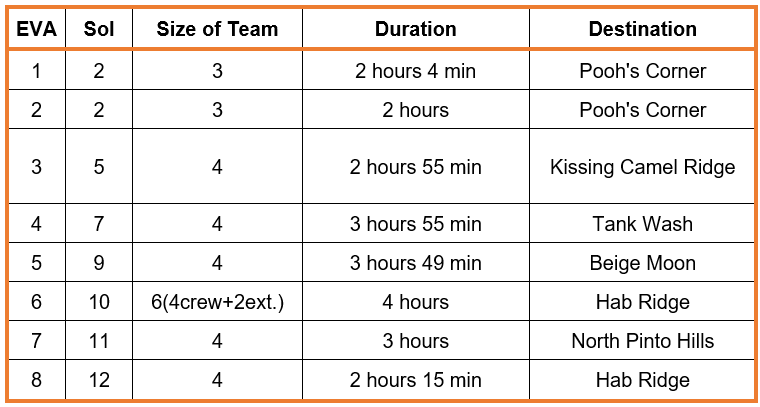 During their rotation in February of 2019, Crew 205 developed a series of procedures and checklists to improve crew efficacy, and generate more operational continuity from future crews. This began from the moment Crew 205 conducted handover training with Crew 204, and concluded with crew revisions after the cessation of extravehicular activities (EVAs). These procedures focused primarily on points of performance for EVAs, unique tasks for Crew Engineers, Health & Safety Officers (HSOs), and element leaders, and critical tasks for crew members who are supporting EVA operations from the Habitat campus. These comprehensive checklists and procedures carefully outline specific tasks regarding Pre-and-Post-EVA checks for leaders and support teams, an HSO Medical Quick Reference Card, an Engineering and Maintenance task sheet, and rotating module inventories. The focus of our outreach project is to Inform, inspire and Involve. 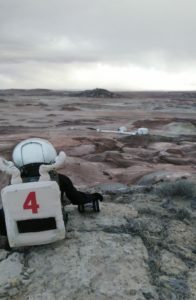 We Inform using videos explaining information about the life and MDRS and about Mars using a small puppet called “Gus”. 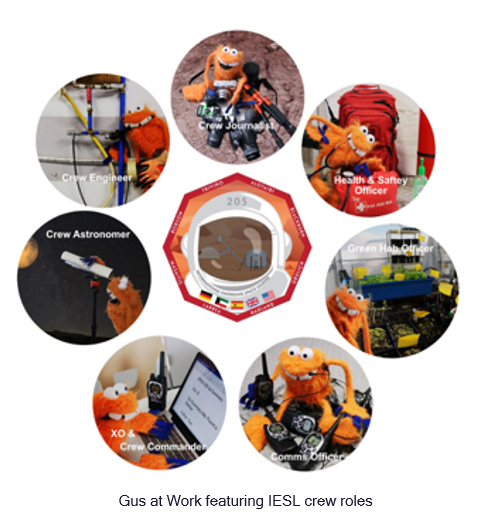 Gus is featured as each crew member who are explaining their tasks and research that they are conducting. The videos are short and kids friendly, easy to understand and will be shared on YouTube and Facebook. A question and answer session was organized on Facebook to involve all followers in the mission. We Inspire as we gave kids the ability to send us their pictures and we did a photo on EVAs. The crew members took several outreach pictures and daily updates were posted on social media platforms. 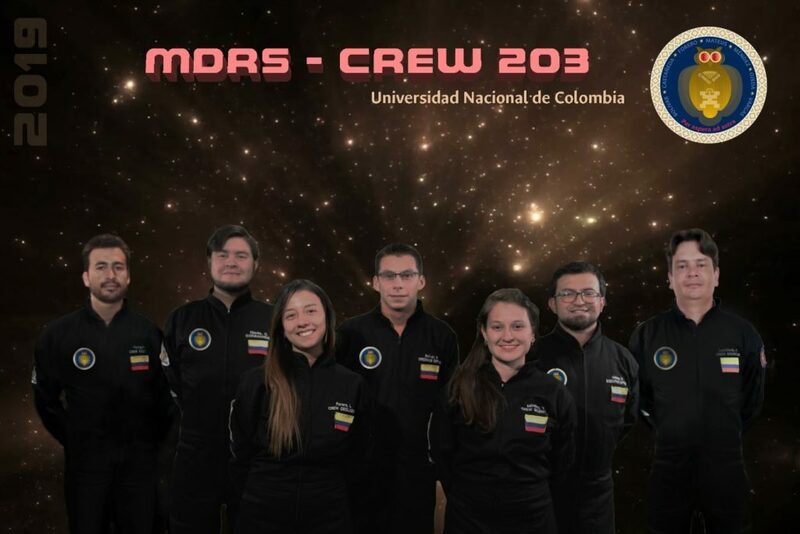 Furthermore, crew members will go back to their institutions to give talks about their experience in MDRS. We Involve everyone sharing all our pictures and videos to make them available for the public. We used several networks that are listed at the beginning of this mission summary. Crew members took pictures and videos throughout the mission. The best photos were sent to our social media channels. Videos for the Youtube channel were recorded throughout the. The talks and visits to high schools and universities will be done when we return from Mars. 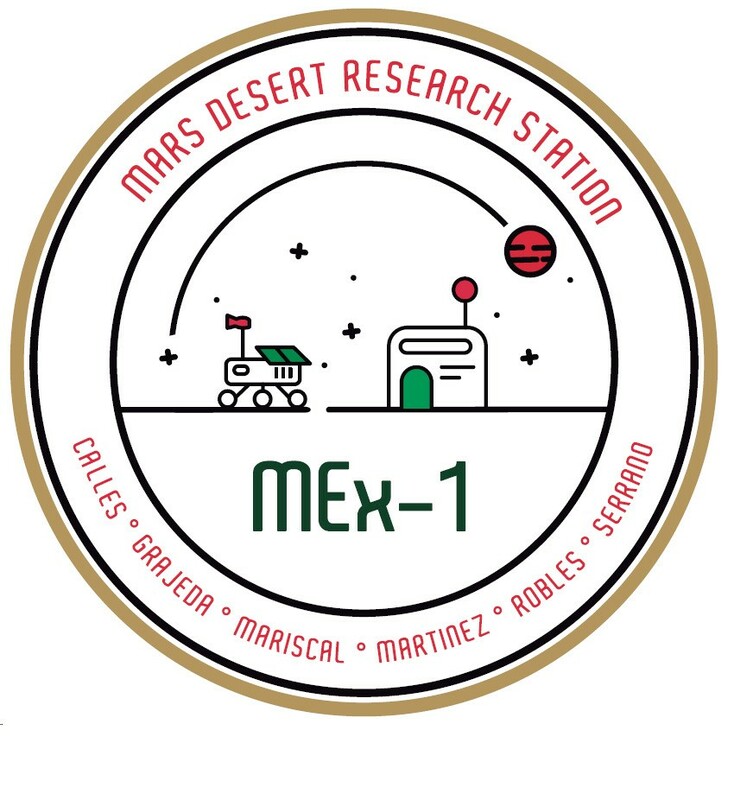 MEx-1 is a Mexican initiative that seeks to encourage the interest of the general population, industry, academia and government of Mexico about the benefits of space exploration and its applications. This through the creation of the first Mexican program of missions in MDRS conformed by a team of astronauts and a ground support on Earth. MEx-1 is a mission that had the previous support of an aerospace doctor and specialist psychologists to evaluate the physical and mental conditions of astronauts prior to the establishment of tasks and workloads of the missions. Integration of a national multidisciplinary team that provides necessary support to the astronaut’s activities that will be carried out before and after the mission. Document and generate the necessary historical information to be able to organize easily later iterations of the mission. Generate media impact necessary to attract and encourage the participation of children and youth in space activities in Mexico. Encourage students and entrepreneurs to develop business activities focused on the creation and integration of projects that benefit and / or use space or high technology resources related to space exploration. Objectives: To know the psychological state and mental fatigue of the astronauts through the daily filling of the mental fatigue questionnaire. Results: The Crew has been doing daily tests to understand the effects of isolation, stress and heavy workloads on people but specifically what are the effects on Mexican nationals. This tests have been received by professional psychologists and will be analyzed during the next few months and give recommendations for future crews with Mexican nationals as well as an opportunity to test it with professionals doing work in isolation like remote ocean vessels and mining stations. Objectives: Measure and document the crew’s weight, water consumption and pressure variation during the mission. Results: The Crew has been doing daily measurements of weight, water consumption, nutrition, heart frequency and blood pressure. This experiment wants to further understand the effects of isolation, stress and heavy workloads on analogue astronauts for future missions as well as to properly prepare selected analogue astronauts on what pre-mission activities are to be done to complete missions successfully. 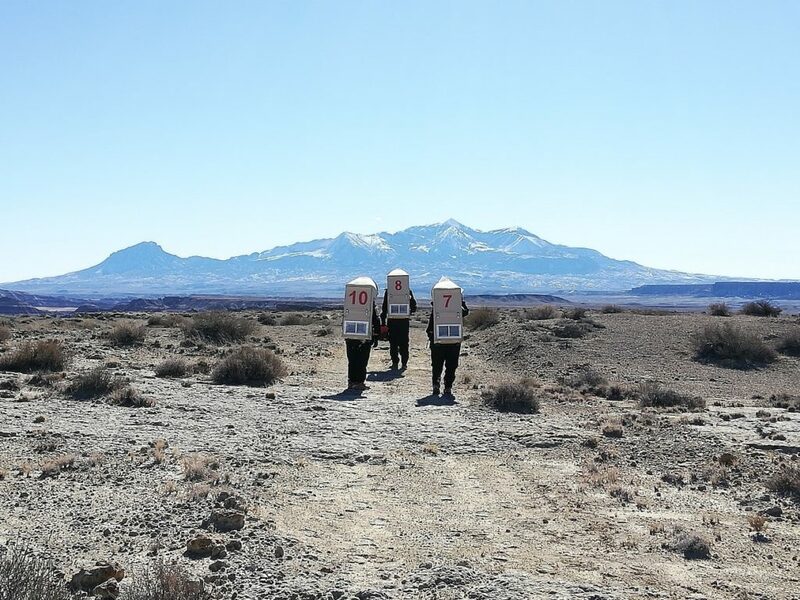 Additional tests on dehydration after EVAs were done to understand the workload and exercise done by analogue astronauts during extended multihour multiactivity missions with space suits. Results: The VSAT pointing experiment was unsuccessful due to logistic delays for the main component of the experiment. Nonetheless, the 3D printer was used to make 9, 10 and 11 cm wrenches that are standard for the nuts and bolts on an standard VSAT kit and can be left at the station for durability tests as well as strength tests that printed tools offer. The VSAT pointing team performed two EVAs to analyze locations to install the VSAT that could be used for connectivity to make a smart habitat as well as locations for possible microwaves with omnidirectional antennas that can serve the purpose of asset tracking and crew EVA safety. Objectives: The main objective of using 3D printing is to provide us personalized tools for our VSAT pointing project and spare parts. This experiment will provide support on the construction of a rover prototype as well, and an analysis of the Hab will be done to use this technology to provide daily use supplies. Results: The use of 3D printing it’s becoming something usual when we talk about manufacture and technology. Having this kind of technology on site gives us advantages as rapid prototyping, personalized tools, variety of materials and many others. The main idea of using 3D printing was to make specialized tools for the VSAT project on MDRS a set of three tools were designed and printed likesome open end wrench of different dimensions (9mm, 10mm, 11mm) that took around eight hours to be finished. Also the design and printing of an adjustable wrench ready. However there were some issues with the weather and the behaviour of the 3D printer with the Martian weather conditions, plus the logistical difficulties of the VSAT system to arrive to MDRS. It made us took the decision to stop the printing of this parts and focus on using the material on making the rover with the preliminary designs. The printing of 28 parts of the rover took about 50 hours. This time doesn´t include failed printed parts, software configuration and machine calibration. At the beginning of mission we assemble, repaired and installed the 3D printer on the RAM. The malfunction of a temperature sensor gave us trouble so it was replaced, however the low temperature inside the RAM was making the parts warping on the corners. After several attends of printing and mechanical and software adjustments, the crew took the decision to move the printer to the low deck of the Hab. This gave us better results, reason why we have been able to print the tools and the 99% of the rover parts. Due to the low temperatures during the last couple of days, it turned harder to continue printing with the cold weather and wind as main factors. These conditions are not the best conditions for this kind of amateur 3D printers. We will continue working in these projects on Earth and as a main objective, we will make improves to the 3D printer to make it capable to print on tough weather conditions, starting with an enclosure to keep the heat, a stronger frame, and an extrusion system capable of reaching higher temperature. Objectives: Generate audio visual content that will be published to increase the awareness of space sector and the interest of young students and professionals in space exploration from Latin America. Results: All the material was recorded and will be under the editing process at the beginning of January. It consists in a series of interviews with the Crew members about their daily work at MDRS and personal objectives. It was directed and produced by the members of Crew 201. Objectives: Validate the function of electronic components in hostile (low) temperature conditions. 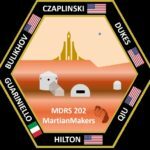 Validate communication protocols for exploration vehicles in the Martian environment. Results: Regarding the electronics architecture and communications protocols of the rover, due to the requirements of the long distances communications; we chose devices capable to transmit at least 1k data. The project consisted in a long distance command data transmission for the autonomous manipulation of the rover. During the first days of the mission, we worked with the electronics to test the code of the data transmission. First, we started to set up the devices with the software, but it seemed that they had a malfunction or that the PCBs were not working properly. We tried with different devices, different laptops and different software, but the problem was still remaining. During several days of trying to communicate with the laptop, we started to think in alternative solutions. 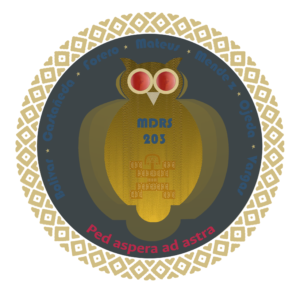 After testing carefully each electronic module and obtaining the same results, we decided to ask for another devices but, unfortunately they never arrived. While we were waiting for the electronics components, we focused in the 3D printing of the Rover and tools. Results: During the simulation we were able to take the necessary pictures to test and train artificial vision algorithms for recognition of patterns of colour, form and size as well as distance and depth estimation using stereo vision. To take the pictures, we used two high definition web cameras fixed and configured to take identical pictures with angle difference. The pictures taken include several kinds of terrain such as flat, big-sized rocks or hills, small rocks (obstacles) and sand. Although the algorithms could not be fully functional due to software configuration issues, the images will certainly be very useful for future work. 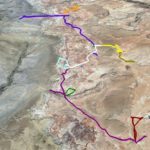 The software developed is part of the autonomous navigation system of a rover prototype that will explore and help in several tasks both in space and Earth. Objectives: Prove the expected behave of the mechanical systems of the Rover. Results: We designed a rover prototype for testing the behaviour of the mechanical parts in hostile surfaces. 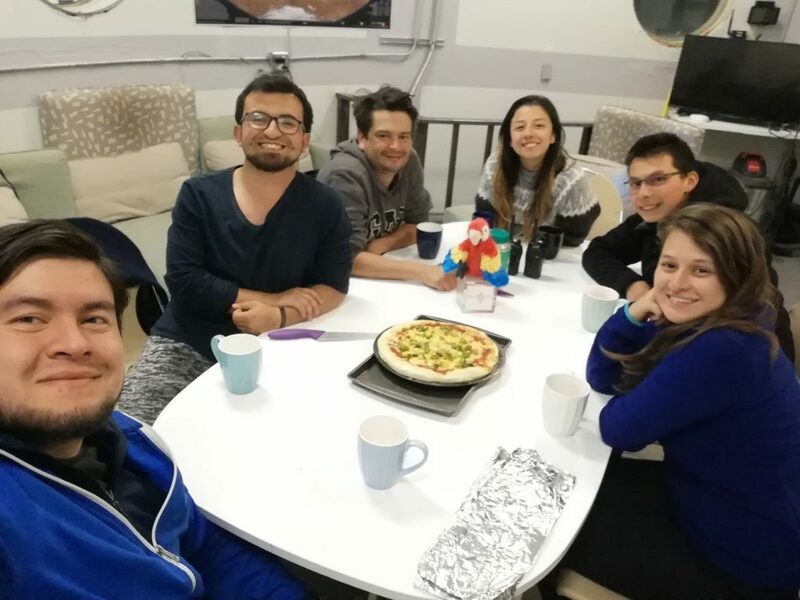 All the Rover design was completed in México and, during the mission, we printed a scaled version of it, due to the original prototype that we were supposed to use at MDRS never arrived because of logistics problems. While printing it, we found that the low temperature inside the RAM was affecting in a bad mode the printing, so we moved the printer in the lower part inside the Hab. Later in the mission, we faced some problems with the printing again, such as the air flow inside the Hab, the place was not the flattest for printing, also, some sensors were not working as they must to, like the thermal sensors of the bed and extruder. This stopped us in the advance of the printing and assembling of the Rover. However, the Rover was built in its 99% and we are still waiting for the last printing parts. 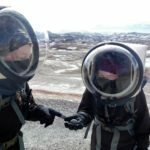 Objectives: Explore, collect and analyze multiple soil samples on the Martian soil on MDRS to test their capability for plants seeding and growing on the Greenhab. Up to 5 different soil samples will be mixed with different combinations of organic material to see which can be used as Greenhab ground. Results: On two EVAs, 5 different soil samples were collected, categorized and used to test their capacity for growing plants. 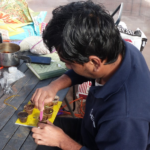 To get started, those samples were mixed with ground soil in small percentages and tested with three radish seeds. 3 of the 5 samples were tested in the following percentages: Type 1 soil sample in 10,20,30,40 and 50% mixes. Only 10, 20 and 30% showed results. 40 and 50 percent didn’t show any progress, probably for the very low concentration of soil sample/ ground used (234g). For types 2 and 3, only 10 and 20% mixes were tested. Both showed results, but in a lower scale, compared to type 1. Next steps suggest a new round, using more organic ground (~800g as total). The next step as well should be the categorization and testing of types 4 and 5 of the Martian soil samples. The experiment ran through 8 sols. A separate and more elaborated experiment summary will be delivered to the next crew’s Greenhab officer to keep track and continue with these testings. · Integration of a national multidisciplinary team that provides necessary support to the astronaut’s activities that will be carried out before and after the mission. · Document and generate the necessary historical information to be able to organize easily later iterations of the mission. · Generate media impact necessary to attract and encourage the participation of children and youth in space activities in Mexico. · Encourage students and entrepreneurs to develop business activities focused on the creation and integration of projects that benefit and / or use space or high technology resources related to space exploration.